Cannot ship to P.O. Boxes. Cannot ship to Hawaii or Alaska. Due to pressurized nature of canister, shipping costs will be higher. 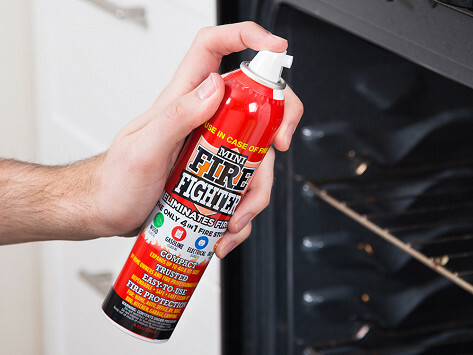 This portable fire extinguisher is small enough to fit in a drawer and as simple to use as a spray can. Its eco-friendly, biodegradable formula works on electrical, wood, oil, and gasoline-based fires. The foam expands to 40 times its size and suffocates the fire, leaving behind an easy-to-clean gel. Keep one in the glove box or your kitchen drawer or bring along on a camping or boat trip. I like the size a lot, easy to keep handy. Looks like it will be easy to use if I ever have to. Live in a small apartment where these 2 extinguishers are welcome additions. Will be even better if I never have to use them.